The first day of May will be unusually very warm, but the rest of the week will have much more reasonable, seasonable temperatures. WASHINGTON — Even though official data have yet to be issued as of publication of this piece, it is looking like April 2017 will go down as the warmest April on record, especially considering the weather of the last few days of the month. The first day of May will also be unusually very warm — and for that matter, quite humid. However, a storm system centered in the Great Lakes will drag a cold front through that will bring some strong or severe thunderstorms and usher in a pattern change. Because the changes are so pronounced, the atmosphere will have a lot of energy and strong winds. The Storm Prediction Center has us in the area of “Enhanced Risk,” which is kind of the middle ground of chances of severe weather happening at all. And within that chance is a higher risk of the scope of the severity of the storms. It means formal watches and warnings could be issued later in the day. But after these storms, the rest of the week will have much more reasonable, seasonable temperatures. 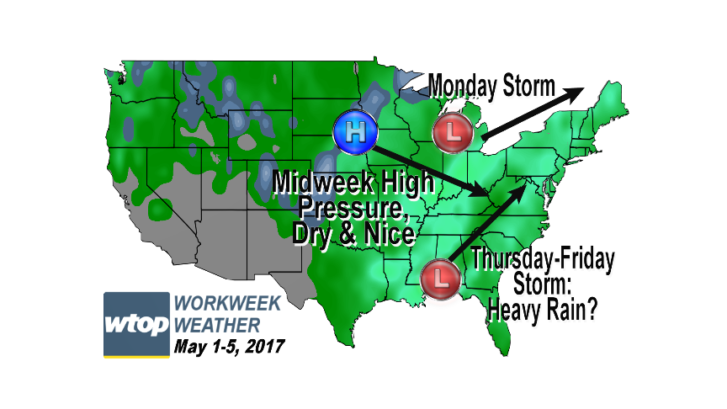 In the wake of Monday’s cold front, high pressure will build in from Canada and start drying us out overnight into Tuesday. Tuesday will technically be above average but it will feel much cooler compared to the summer-like weather we will have just displaced. Wednesday looks spectacular with seasonable temperatures. A strong storm system will form near the Gulf Coast states Thursday into Friday, bringing them severe weather. A lot of the computer model guidance suggests it heads up the mountains toward us, bringing us some more needed wet weather. It is looking like April 2017 will go down as the warmest April on record, especially considering the weather of the last few days of the month. The first day of May will also be unusually very warm, but the rest of the week will have much more reasonable, seasonable temperatures. • The average high on April 1 is 61 degrees and 71 on April 30. • The average lows, respectively, are 42 and 52. • The record high temperature for April is 95, set on April 17, 2002; April 18, 1976; April 23, 1960 and April 27, 1915. • The all-time warm low temperature was 69, set on April 19, 1896. • One record high, 91, tied on April 29. • Three record warm lows: 65, tied on April 16; 64, tied on April 21; and 70, set on April 29. • The record warm low on April 29 is the record warmest low temperature for the entire month of April. • Only eight days had a high temperature below average. • Only three days had low temperatures below average. • Ten days had highs 80 or above. So the month certainly had days where it felt warm, if not hot. But there were many days and nights in which it was merely technically above the averages. The days with cooler-than-average temperatures had some beneficial rainstorms. As of publication time, final data was not in for Sunday and that may change the record warm low. All data are considered preliminary until certified by the National Climatic Data Center. Averages are based on the years 1981-2010.